This morning I had the much anticipated post-chemo PET/CT. It was much anticipated for many reasons. Of course, the most important reason is that we hoped it showed remarkable improvement over the initial PET/CT that I had prior to the start of chemo. But secondly, it was anticipated because I had an allergic reaction to the CT contrast last time, which left me with annoying, extremely itchy, hives for several weeks. A prescription of Prednisone and Benadryl over a couple of weeks towards the beginning of my chemo treatment helped to thankfully resolve the hives. So, this time around we were going to be prepared with some pre-medication prior to my exam. This involved multiple 50mg doses of Prednisone (13 hours, 7 hours and 1 hour prior to the exam) and 50mg Benadryl one hour prior to the exam. Those of you who have ever taken prednisone, a pretty strong corticosteroid, know that it is pretty nasty stuff. You always want to take it with food to avoid feeling very ill. So, I took my "13-hour prior to PET" dose along with some delicious scrambled eggs and then went to bed. Unfortunately, I missed my alarm for the 7-hour prior to the exam dose, which put me into the "no-food 6 hours prior to the exam" zone. This meant that if I were going to take the dose, it would be without food. Because I already felt awful from the previous 50mg dose of prednisone, I prayed about it and decided to skip the dose. On the way to the exam, I took the Benadryl dose. When I arrived, they told me that I actually didn't even need the CT contrast this time around. Praise the Lord! This meant that I would not have the allergic reaction and didn't have to worry about the other doses of Prednisone I missed. This was praise #1 of the day. So, they injected me with the FDG, a radiopharmaceutical, which after injected into me, the PET scanner can form images of the distribution of FDG around the body. After the injection, you have to lay still and in silence in a quiet room for an hour while it distributes around your body. As I lay in the room under the warm blankets and in silence, I reflected on what has transpired over the past 5 months. I was not at all concerned over the results of the PET, because I had an amazing peace that God was at work in me and was healing me. Instead, I just spent an hour thanking Him for all of the amazing things He has done. I just told Drew this weekend that I am happier right now than I have ever been. I am just SO happy and have so much Joy! So, during this hour, I had a lot of "thank yous" to give back to God in prayer. The PET exam itself just took about 17 minutes. Then, the wonderful clinic manager at ARA checked with the radiologist to see if he minded briefly reviewing the exam results with me (I used to work at ARA). He kindly agreed, so I made my way back to the reading room. The radiologist showed me the before and after images of my body and the cancerous regions. To sum it up, he told me (not his exact words, I'm sure, but how I remember it), "see there where there was cancer before... I just can't see anything now." I said, "wow, that is amazing--miraculous." He said, "yes, the chemotherapy worked!" He, of course, qualified his statements with "there could be microscopic cancer that is not detected by the PET." I quickly said, "yes, but thankfully, I am having surgery to remove the breast and axillary lymph nodes and then I will have radiation for the other lymph nodes that were cancerous before but not removed." I was so happy to get to see the results immediately and discuss it with him. The funny thing is, I didn't jump up and down or act elated. I think it is because I already had a confidence and peace that God was at work at completely healing me. I am glad I was able to discuss the results with the radiologist though, because it is much more difficult to tell the results were fabulous by looking at the actual documented report, since it is in medical terms that I do not understand. So, if you are like me, you are probably wondering what some of the terms in the report mean. "Interval Resolution" usually means complete resolution in the "interval" of time since the last or comparison exam. So, in my case, he indicated that the area where there was significant uptake of the FDG (cancerous areas) on the left breast from before were now gone. 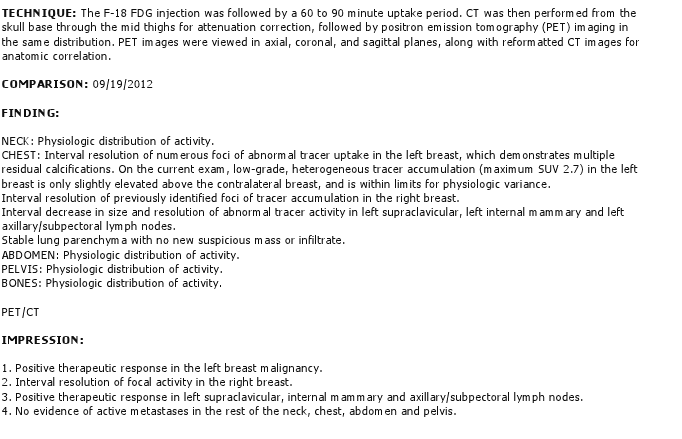 Also, there is interval resolution in the right breast, and the lymph nodes that were of concern before (left supraclavicular, left internal mammary and left axillary/subpectoral nodes). This is all great. In my mind, this means "No CANCER!" My oncologist's nurse actually said that every radiologist has a different "style" of documenting findings, and some may even say, "No evidence of disease." She thought the report was fabulous as well! To sum it up: I am SO HAPPY! I am being miraculously healed. I have been told that to see complete pathological results (or healing) is very rare with my Estrogen positive cancer. As I mentioned in a recent post, these estrogen positive cancers usually don't respond this well to chemotherapy. Keep in mind that I was originally staged at stage 3c--just a hair before being classed as terminal cancer (stage 4). My tumor was humongous at 14 cm! The cancer was extensive--in SO MANY lymph nodes and had left the breast area to travel to the internal mammary lymph nodes (sternum area) and left supraclavicular lymph nodes (above the clavicle in my neck). It is virtually gone--none of these areas were lit up on my PET. Praise the Lord! I am looking forward to the next step, which is surgery to remove the left breast and axillary lymph nodes. It is after surgery, when we receive the pathological results, that we will see what remains at the microscopic level. I did find out today my surgery date is once again being moved. So, please pray that we can get all of this worked out. I am not going to mention the new date just yet though, because I am really hoping everything gets resolved so that I can keep it for next week. Thank you prayer warriors for your continued prayers during this battle! I smell victory!